During the Ice Age, steppe bison – the ancestors of modern bison – migrated to Alaska from Asia, crossing the Bering land corridor. The three bison were all big, but one shaggy bull dusted with snow stood out. Hunter Travis Smith, 14, knelt and rested the heavy octagon barrel of his buffalo rifle on a shooting stick, then took aim at a 1,200-pound Alaska buffalo. A herd of about 400 wild, free-ranging plains bison roams the countryside near Delta Junction in Interior Alaska. About 16,000 hunters apply each year for the chance to hunt these massive beasts, and only 130 people received permits last year. Smith was one of the lucky few to draw a permit, and he headed 500 miles north to Delta from his home in Kenai last November with his father, Roy Smith, and family friend Paul Bell. During the Ice Age, steppe bison – the ancestors of modern bison – migrated to Alaska from Asia, crossing the Bering land corridor. Far larger than modern buffalo, with much longer horns, these giant herbivores shared the tundra of prehistoric Alaska with wild horses, wooly mammoths and western camels. As the ice sheets advanced and retreated, these migratory animals spread across North America. Bison evolved into two subspecies, wood bison and plains bison. The giant longhorn steppe bison became extinct. Wood bison adapted to life in the north, grazing in the meadows and forests of Alaska and Canada. The smaller plains bison thrived farther south and formed the famous buffalo herds of the American Great Plains. Although wood bison can still be found in Canada, they disappeared from Alaska about 100 years ago, likely because of hunters and changing environmental conditions. 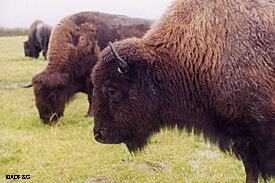 Plains bison were introduced to Alaska in 1928. The animals in the Delta Bison Herd are all descendents of 23 plains bison from Montana. The herd increased steadily throughout the ‘30s and ‘40s, and in 1950 a hunting season was established to stabilize the size of the Delta herd. Emigration and transplants created additional herds at Copper River, Chitina River and near Farewell, and a few dozen permits are issued each year to hunt animals in these herds as well. The Delta Junction Bison Range, a 90,000-acre tract of public land, was established in 1979 near Delta to ensure adequate winter range for the animals and to diminish damage caused by bison on adjacent farms. Bison spend fall and winter on the Delta Junction Bison Range and on private land in the area. During calving season, between late April and early June, they move a few dozen miles southwest to the gravel bars of the Delta River. The bison summer along the river, and they can be seen on the gravel bars along the Delta River from several viewpoints along the Richardson Highway. Roy Smith said he applied for the Delta bison hunt for a number of years without luck. This year, at about 100-to-1 odds, his son Travis drew a permit on his second try. A young but experienced hunter, Travis took a black bear when he was 11 and has successfully hunted moose as well. Roy said when he told people that Travis had drawn a permit, he found a prevalent misconception. The Smiths talked to other hunters and a number of Delta locals for advice. They studied animals in a private bison herd to help them differentiate between bulls and cows, which both have horns and can appear similar. “The farmers and locals told us these free ranging animals are almost always on the move, constantly grazing, and they tend to walk into the wind,” Roy said. They’re generally in groups of 12 to 40 animals, he said. The Smiths hunted for a week in mid-October and then returned home to Kenai. In late November they were back in the Interior for another try. Although numerous roads transect the Delta area, it’s a patchwork of public and private land, and the bison roam throughout the area. They had secured permission to hunt on some farmers’ fields, and they worked both public and private land, scouting from the truck and then stalking on foot. Travis said he was surprised how difficult buffalo are to stalk. It was about 15 degrees and snowing when they spotted a group of three in the early morning light. After carefully determining the gender, Travis took his shot. He was using a Browning model 1886 lever action .45-70, with open iron sights, a replica of the old Winchester government model of the 1890s that the historic buffalo hunters used. The three buffalo ran off a few hundred yards, and the hunters hustled through the foot-deep windblown snow and stopped at a grassy outcropping about 100 yards from the bull. Several more shots brought the bull down. Roy said not only is a lot of bullet energy expended in penetrating the very thick hide of a buffalo, but the hide dulls a knife quickly. He measured the bull at 8-foot 3-inches from the tip of the nose to the base of the tail. He said they plan to have a shoulder mount done of the bull and a European style mount of the skull as well. In addition to the hide, which they plan to have tanned, the bison yielded about 400 pounds of boned-out meat. Roy said the meat is very tasty, with about one-fifth the fat of beef and no gamey flavor at all. This year, permits to harvest about 45 bulls and about 45 cows from the Delta herd will be issued. Hunters apply by May 31 for the hunt, and the season runs from Oct. 1 to March 31. Hunters are assigned a specific hunting period within that time. The $10 application fee goes toward helping to manage the bison range.